As a result of the increased transparency in the commodity trading business and therefore the smaller margins, one of the main global trends nowadays is that commodity traders are undergoing a variety of processes to transform commodities into products that we can actually consume. Trading in agricultural, energy and industrial commodities is often seen as market focused, creating trading P&L, with sometimes a negative connotation, Craig Pirrong, Professor of Finance at the Bauer College of Business states in the report ‘The economics of commodity trading firms’. But more and more commodity traders operate between production and distribution along with other actors from the supply chain. In this way they shift from a trader role to more of a merchant role, creating value for their customers. To create value commodity trading firms need to become professionals in the areas of logistics, storage and transformation. Firms attempt to identify the most valuable transformations, undertake the transactions necessary to make these transformations and engage in the physical and operational actions necessary to carry them out. Examples of this are having access to mills, roasters, refineries and steel plants. Creating value implies knowing what the customers want on what moment, in what quality, in what packages and for which price. Developing long term commercial relationships with buyers result in more insight in their needs and demands. At the same time, knowing and being able to predict needs and demands asks for developing long-term commercial relationships with producers addressing the quantity and quality requests of buyers. This results in more use of long-term supply contracts and collaborative agreements. By doing so commodity firms need to enhance and optimize their logistic chain and IT infrastructure. These firms need to analyse the buyers and sellers, the supply and demand patterns, the price structures and need to have an overview of the transformation technologies. Given the complexity of this transformation, and the ever-changing conditions that affect the efficient set of transformation, this is an inherently dynamic, complex, and highly information-intensive task. At this moment, traders in agricultural commodities adopt these changes rapidly. Grain, for example, is being harvested only in a specific period in a year. 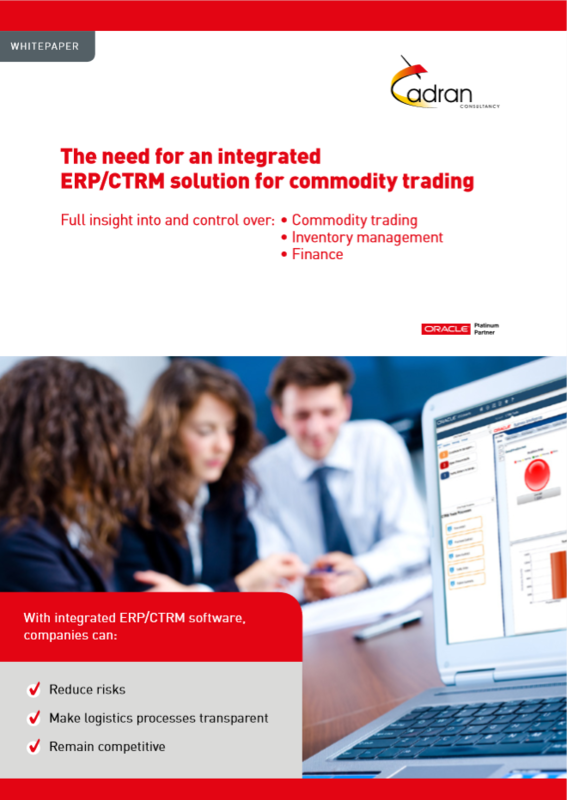 How can commodity traders make sure they can supply their customers year-round? What are the best ways to storage the grain, how can they assure the quality and how can they stretch the time the commodity is preservable? It’s absolutely clear that also the IT infrastructure needs to transform to get the global insight of all variables and to collaborate with all players in a dynamic and successful way. Complete visibility on short term and long-term supply and demand, inventory and production planning including customer and market trend analysis is required to facilitate commodity traders to optimize their value chain and make the difference. To stay competitive in Commodity Markets this global insight is key for any trading company. This blog is a first part in a trilogy on main changes in commodity trading; supply chain development and the relation to required IT and data architecture. Read also part 2: Do commodity traders have the information they need to tackle the ever increasing complexity?